Today, communication skills are among the most valuable skills in any professional environment. They are at the core of successful teamwork and in the very definition of superb customer service. The good news is that a set of excellent communication skills is not just an innate talent. One develops it with years of experience. Alternatively, simulation software can hone one’s communication skills to perfection in a faster and more efficient way. Customized practice created with iSpring Suite helps professionals around the world to refine every conversation with a client or a colleague. To most employees, simulation games are generally more engaging and interesting than case studies or subject lectures. However, they can yield negative results if approached without due consideration. The following tips for working with scenario-based training will teach you how to get the maximum value out of iSpring Suite or other training simulation software. Bonus tip! For many employees, training is a tedious requirement that they simply want to get done with. You can ignite your trainees’ enthusiasm by emphasizing their own enrichment from a given exercise. Explain how it is relevant to their day-to-day tasks and inspire them to learn from the simulation activity. In order to strengthen the perception of relevance, consult the Suite Library of locations and characters. You can choose from multiple backgrounds suitable for business, manufacturing, medicine, education, and travel situations. Each of the 20 built-in characters features 5 emotional expressions – happy, normal, puzzled, unhappy, and angry – that you can specify depending on the trainee’s reply choices. Remember, human communication is more than speaking and listening: it includes body language and facial expressions. Bonus tip! How about uploading your own photos of familiar spaces or people? Your trainees will not only connect with a scene in a more personal way but also appreciate your creative input. In contrast, if your goal is to prepare the trainee for new and unusual situations, opt for foreign-looking or surprising settings. Now to the essence of your training simulation – how to design a conversation. The mere thought of developing questions and comments may seem overwhelming and compel you to hire a training specialist. However, designing a script could not be easier with the intuitive drag-and-drop Suite editor. For the initial question, provide reply choices, each of which will lead to a new question. Suite builds a dialogue tree, a well-organized structure that you can manipulate with one click of a mouse. Bonus tip! Not sure how many scenario paths to implement? There is an even simpler approach than growing tree branches. Create short forks in the road, with 2 or 3 reply choices, and then merge all paths back together to a new question (see illustration below). An important feature that makes all the difference is “Add message.” With this button you can add a comment to every reply option and help your trainee understand why his or her answer was either advantageous or disadvantageous. However, don’t simply pass judgement (“This is an incorrect answer!”) or immediately give out solutions (“The best answer is…”). Instead, offer a suggestion that the trainee can reflect and learn upon. Bonus tip! Go to “Simulation Properties” and select “Allow restarting the simulation.” With your advisory feedback in mind, the trainee will modify previous choices and get the hang of the situation. This way your trainee is an active thinker and not a passive task-doer. You know that some people respond to scoring systems with numbers and passing marks better than to verbal feedback. If your trainees belong to such a type, iSpring Suite has just the right feature. Enable simulation evaluation in the Properties in order to activate graded simulation and pick a passing score. Like the interactive messages described above, this option will let the trainee restart the entire simulation and then aim for a higher score. Bonus tip! While a certain degree of competition can improve trainees’ output, be careful not to spur unnecessary envy among members of the same team. Also, don’t discourage learning by setting a passing score too high: you want to imbue your trainees with confidence, not low self-esteem. Make sure to clarify that the ultimate goal is not a specific score but acquiring a certain skill that the trainee will benefit from in a real world situation. Because iSpring Suite supports HTML5 technology, you can use published simulations on any type of device: Windows PC, Apple Mac, iPad and iPhone, Android, or Windows Phone. In addition, you can publish a simulation on the web and send its link to the intended trainees.If you are an educator who uses Blackboard or Moodle, iSpring Suite is compatible with these and other major LMS platforms, and is fully integrated with its own iSpring Learn LMS. Bonus tip! No matter what player you are using, take advantage of the voiceover option and record audio narrations that will make your dialogues truly lifelike. This can be especially useful for training employees in understanding strong foreign accents. Plus, browse through the available color schemes to customize your simulation. For example, did you know that blue is the color that helps the human brain to concentrate? After your trainees complete a simulation, the software will usually lay out their results for you to analyze in and out. This data is important: use it for learning more about your team and rely on it when composing new simulation scenarios. More importantly, however, ask the trainees for thoughtful feedback on their learning experience. Let them reflect on what they have gained in the process and how the skill that they practiced is applicable in the real world. Bonus tip! Now that your employees feel equipped with knowledge, don’t let the positive results fade away. Assign a task to each employee that will echo a simulation scenario. Then your employee will re-enact the path to a favorable solution but with a real-world sense of responsibility. This way the lessons gained from the training simulation are bound to be long lasting. These Suite demos show two training simulations with a car sale dialogue and a bank dialogue. Note how both employ the tactics suggested in this article, such as creating realistic settings and inserting advisory messages. Give it a go with a 14-day free trial here. 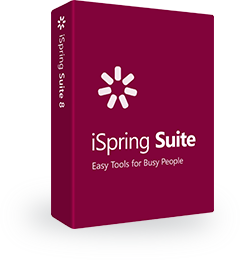 iSpring Suite was created to prepare professionals for diverse situations that can arise in their workplace. It is not meant to simply instruct in mechanical skills but to focus on human-centered subjects such as ethics, teamwork, or cultural diversity. With scenario-based training, you have an opportunity to give your trainees the gift of confidence and readiness to engage in any conversation. Use our tips and you will inspire your team to perform their best and continue developing their skills. Training simulations avail far beyond employee training. Consider our advice above for assessing communication skills in your team and discovering common “weak spots.” iSpring Suite is also a good tool for counseling practice, preparing for a Q&A session at a conference, and even learning languages – haven’t you always wondered how to reply to “wie gehts” or “come stai”? If you found a new way to use iSpring Suite, leave us a comment and we will share your story with the international iSpring community.